National Jersey Day was created to bring awareness to sports in Canada. It is an agreed ‘statement of facts’ that sports build up a sense of community and dreams of success and fame in youth and are a fun and healthy activity for families to share, and individuals to engage in for optimal fitness. 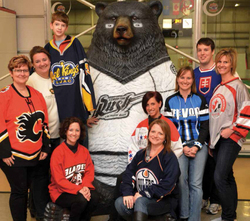 All over the region, business teams and individuals enjoyed an opportunity to wear a jersey of their favorite team. Janet Guthrie, new Sports Tourism Coordinator at the LRC since August, emphasized the power of sports in Canada, and among our Capital Region’s residents. Regarding National Sport Day, she enthusiastically described the addition of unique sport features to the regular schedule of the LRC: the climbing wall challenge over the pool, underwater hockey, a floor hockey challenge for families, a free nutrition session with a renowned nutritionist and the demonstration of the LRC’s new TRX, a state-of-the-art, extreme fitness workout piece of equipment. The extreme cold snap was expected to bring in ‘healthy’ crowds of visitors on that day. She added that beside a large number of LRC staff members, she saw many jerseys at the Civic Centre as well. See more Jersey Day photos in this week’s paper.